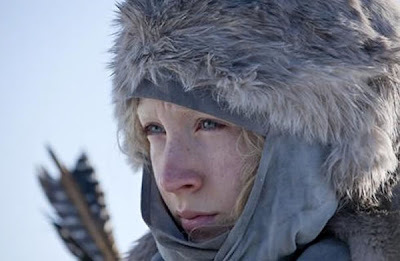 In the wilds of Sweden, Hanna (Saoirse Ronan) has been trained by her father (Eric Bana) to become an assassin. When she is ready, her father sends her out on a mission. Left on her own to face a world she has never experienced, Hanna must face the dangers she was trained against in order to do her father's bidding, but also learn about life and relationships with others. A top level agent (Cate Blanchett) seems to be behind all this and as Hanna nears her final target, she discovers the truth of her existance and that all may not be as they seem. I think the plot is extremely interesting and love that we now have another femme fatale, a role Saoirse Ronan is sure to be recognised for. It seems extremely gripping and full of action, though hopefully the "revelations" and secrets will not be at all like "Bourne" as films nowadays just seem to feast on the same plotlines (like upcoming film Unknown. Cate Blanchett will no doubt stun us with her performance as this evil operative, and I am anxious to see Eric Bana in action again as the last film I saw of his was "The Time Traveler's Wife". The film is set to be released next year. It sounds like an interesting movie, based on the sound of the cast and plot.